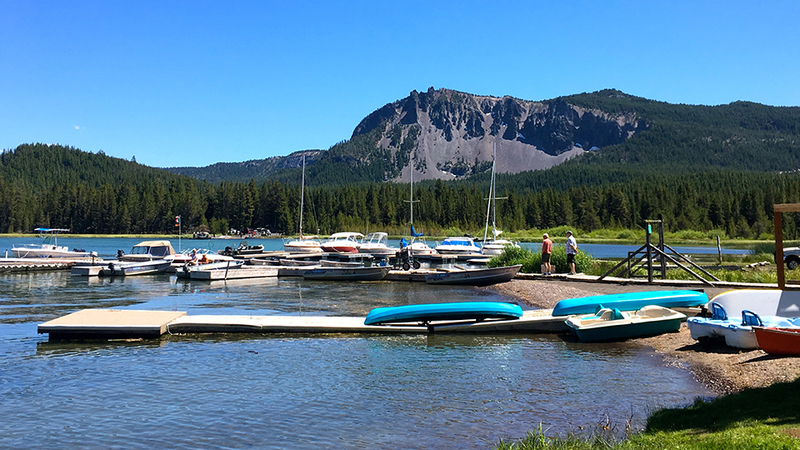 Located in the Deschutes National Forest, Paulina Lake Lodge offers family resort fun in the summer and winter. The rustic lodge is set on the shore of Paulina Lake, inside world-famous Newberry Caldera, formed by ancient volcanic activity in the crater of Mt. Newberry. Paulina Lake Lodge offers 14 different rental cabins with floor plans that can accommodate as few as three guests or as many as ten. Each cabin has been recently updated but still maintains the rustic feel that lets you know you’re away from home…in the best possible way. Complete with bar and coffee barista, the Lodge is a fantastic place to stop in for a delicious hand-crafted lunch or dinner. During the summer, the Lodge’s experienced staff is happy to offer advice on where to go and how to hook up for the best fishing. They also have rental boats and motors, moorage, gas and oil to keep you out doing what you love best. In the winter, you will enjoy snowmobiling, snowshoeing and cross-country skiing on more than 150 miles of groomed snowmobile trails and several ungroomed cross-country trails, all right outside your cabin door. Visit the website for current dates of operation and reservations, and plan your Paulina Lake Lodge adventure.